Rose Hughes makes a dual-purpose planter, the perfect pretty-yet-practical accessory for the summer garden. Your will need: Pot approx. 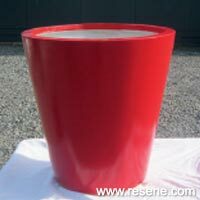 500mm tall – I chose a fibreglass/cement composite pot, paint brush and roller kit, Resene Concrete Primer, Resene test pots in your chosen colour, Resene Concrete Clear, PVC pipe – 700mm x 50mm,	saw, weed mat or similar,	pumice – I used 2 x 5-litre bags of perlite root mix as a substitute,	25kg easy mix concrete,	4 x 300mm dowel offcuts, Potting mix, Plants, umbrella – the 300mm coolaroo mix & match umbrella frame & ‘cherry’ canopy pictured were kindly supplied by Mitre 10. 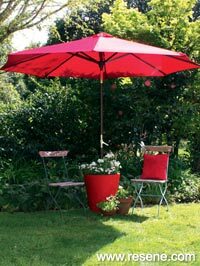 I used a firbreglass/cement pot with a wide enough base so that it will be stable with the umbrella in it. Apply an undercoat of Resene Concrete Primer. Apply two topcoats in your chosen colour, (I used ‘Jalapeno’ to match the umbrella canopy) and allow to dry. Apply Resene Concrete Clear following the instructions. This product comes in flat, satin and gloss fnishes and I used the gloss to mimic a glazed pot. Cut the pipe so it extends 200mm above the lip of the pot. 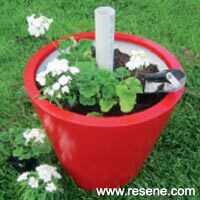 Cover the drainage holes in the base of the pot with an offcut of weed mat or similar. Centre the pipe and add the pumice or perlite to hold it in position. Mix the concrete following the instructions. Gradually layer on top of the pumice, creating a slope away from the pipe to aid drainage. 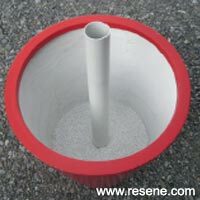 While the cement is still wet push dowel offcuts in through the layer of cement. 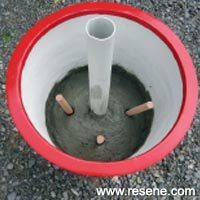 Wiggle the dowels so they can easily be removed when the concrete is dry. Allow to dry. Move the pot into position before adding the potting mix and plants as it is heavy. Add the umbrella, you may need to cut small timber triangles to hold the umbrella straight inside the pipe.